A Washington, DC, animal shelter that has been taking in abandoned Trump Administration officials and cabinet members has announced it is at capacity and cannot take in any more until space is freed up. They say they were already full when someone dropped Rex Tillerson off, but he looked so sad and helpless that they relented. The addition of Generals McMaster and Kelly has made the situation even more critical The shelter is warning anyone who attempts to leave Kirstjen Nielsen at their facility that they will be turned away. 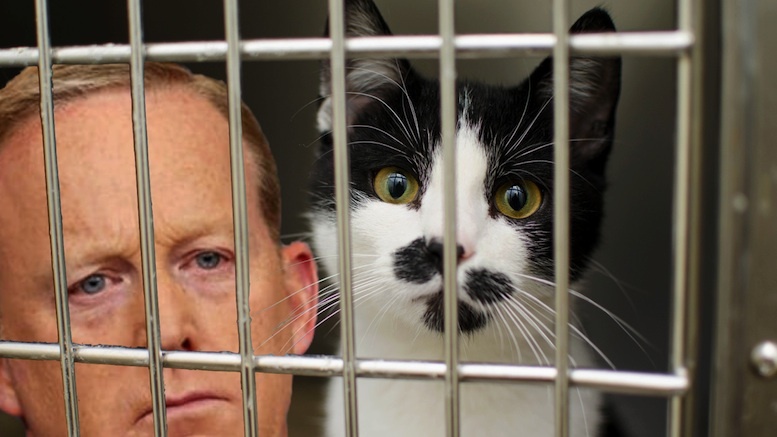 The problem, they explain, is that as a no-kill shelter there are limits on how many feral cats and former Trump officials they can accommodate at one time, though they say that could change in the future. 11 Comments on "No-Kill Shelter Can’t Accept Any More Abandoned Trump Administration Officials Right Now"
What I think is more important is that they spay or neuter every unfortunate they take in. The burden of unwanted Trump administration officials is reaching a crisis point. Sure, they may seem cute or even lovable when you bring them home, but every month more and more of these helpless creatures are left under buses or hanging in the breeze. Please. Be sure to spay or neuter. this was so clever, but so many were left out, guess the shelter is full of all of them. Hopefully they will all be cleared out by the election. Yup, we are forced to neuter them, clip an ear tip , and release them to make out as best they can. So sad. Great satire! I agree wholeheartedly with Max’s comment. PLEASE include McConnell, Ryan, & Stephen Miller (altho he’s so evil it’s really impossible to make light of) in your next posts! I think it is somewhat mean to house those monsters with innocent animals. You really might want to reconsider your “no kill” policy when it comes to ex-tRump officials. After all, it would mean putting them out of their (and OUR) misery. I seriously wonder about anyone trump ever appointed that is true, but I also seriously doubt he ever had real reason to fire anyone so lets not kill them based on them being fired by trump. Thank you for making us laugh in a time that is so difficult to even smile during political news. Every day there is some negative news about that person in the White House. It was tiring. I welcome this kind of humor. Don’t stop and don’t forget about Ryan and McConnell. Same here!! This is great!! This one made me laugh to tears! Thank you SO much, I really needed that laughter! !